Carla Tolle's 13-year-old grandson Edgar Vazquez of Kelso, Washington was killed in an accidental shooting involving an unsecured shotgun. She is now campaigning for I-1639. 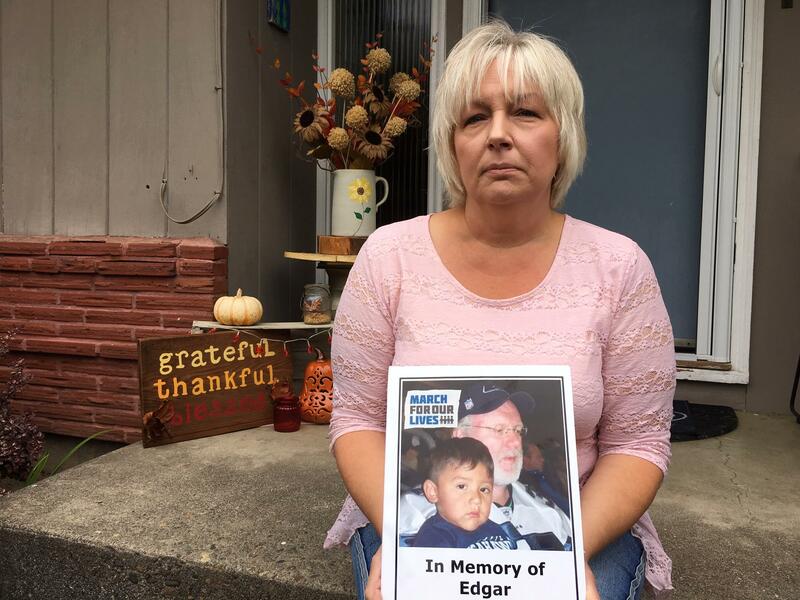 A year ago this month, Carla Tolle’s 13-year-old grandson Edgar Vazquez was shot and killed by a friend while they played at the friend’s grandfather’s house in Kelso, Washington. This spring, the friend was convicted of second-degree manslaughter and sentenced to five months in juvenile detention. The grandfather who owned the loaded, unsecured shotgun was not charged. Now Tolle is campaigning, in her grandson’s memory, for passage of Initiative 1639 on Washington’s November ballot. Initiative 1639 is a sprawling, 30-page ballot measure that seeks to restrict access to semi-automatic rifles like the popular AR-15, which has become synonymous with mass shootings. But the initiative would also require the secure storage of firearms. Under the initiative, if a gun wasn’t safely stored and ended up in the wrong hands and someone was injured or killed, the gun’s owner could face felony community endangerment charges. The I-1639 "Safe Schools, Safe Communities" campaign is sponsored by The Alliance for Gun Responsibility and has financial backing from Washington billionaires Paul Allen, Steve Ballmer and Nicolas Hanauer. To date, it's raised $4.45 million, according to filings with the state's Public Disclosure Commission. According to an analysis by the Washington state Legislature, the majority of states, including Texas and Florida, have some sort of safe storage law. Washington and Oregon are among the minority of states that do not, even though research suggests safe storage laws reduce accidental shootings. “If this gun would have been safely stored, Edgar would be alive,” Tolle said. But opponents of I-1639 argue that a one-size-fits-all requirement to securely store firearms could cost lives, especially in a life-or-death situation. 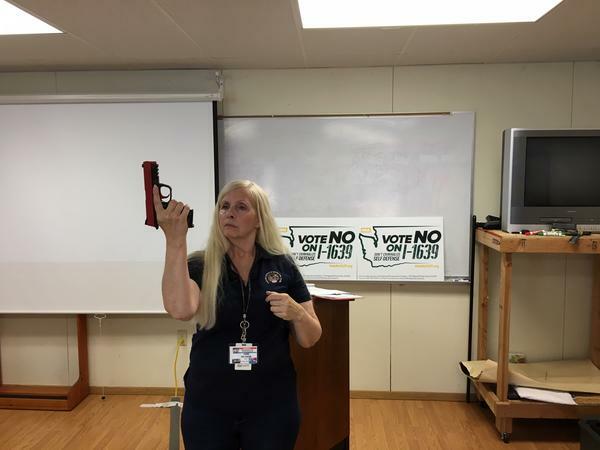 “When someone breaks into your house, you have seconds to respond,” said Jane Milhans, a National Rifle Association-certified firearms instructor who is volunteering for the No on I-1639 campaign. There are four registered opposition campaigns to I-1639, including Washingtonians and the National Rifle Association for Freedom and Save Our Security No On I-1639. Combined, the opposition has raised $246,841 to defeat the initiative. Milhans specializes in teaching women how to safely use pistols and long guns. She said it’s a passion that grew out of personal experience. A decade ago, she came home to find a pair of burglars in her home. “They had armfuls of stuff from my house and were trying to get out the back door when I walked in on them,” Milhans recalled recently. She owned a gun at the time, but did not use it that day. Milhans said the experience reinforced her belief that a pistol by the bed or in the purse is a way women can protect themselves. Milhans said it’s not always feasible to keep a gun under lock and key. She and other opponents of I-1639 argue the secure storage requirement in the initiative amounts to criminalizing self-defense. “A lot of women I teach are elderly widows and they may want to keep that firearm where they can grab it quickly,” Milhans said. In cases where an unsecured gun was brandished, discharged or used in the commission of the crime, the owner could be charged with a gross misdemeanor. Milhans is also troubled by the idea of criminally prosecuting a gun owner whose firearm is used in an accidental shooting. “Parents do and should teach their kids firearms, but making them a felon—I don’t agree with punishing them twice,” Milhans said. But for Carla Tolle, the most compelling argument in favor of I-1639 is research that shows a gun in the home is more likely to be used in a suicide, homicide or accident than in self-defense. At her home in Kelso, Tolle has created a memorial wall for her grandson. There are pictures of Edgar as a toddler, on family camping trips and attending Seahawks games. Perched over the photos is a small statue of St. Felicitas of Rome, the patron saint of parents who have lost a child. A year later, she is still struggling to accept Edgar’s death. “It was the furthest thing from my mind that one of my grandchildren would be killed by a friend with an unsecured firearm,” Tolle said. This is the Alliance's third effort in six years to pass a gun control initiative. In 2014, the Alliance sponsored a successful initiative that expanded background checks to include person-to-person gun sales. In 2016, Washington voters approved another Alliance-sponsored iniative that gave families and police the ability to petition a court to seize a person's firearms if they posed an "extreme risk" to themselves or others.